10. Commodities – Is gold shining again? The global economy experienced a steady slowdown in economic activity over the course of 2018. 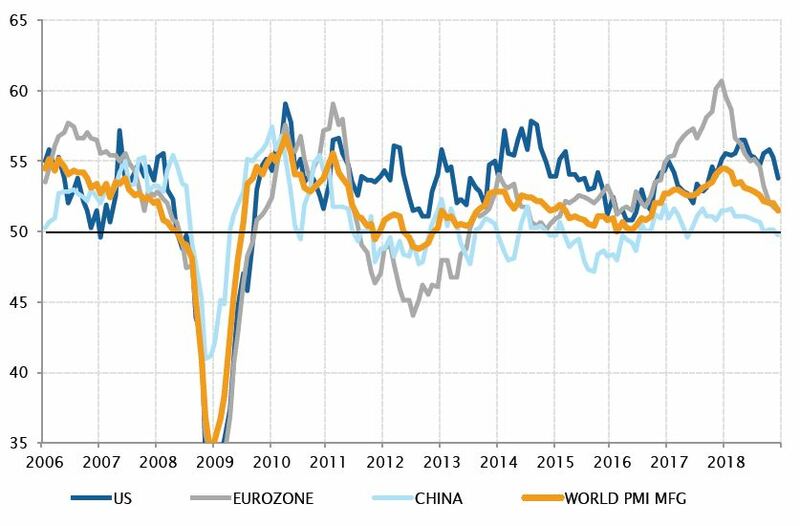 After a synchronised and harmonious acceleration in 2017, with the strongest global growth rate in six years, the pullback was certainly more pronounced than expected in 2018. 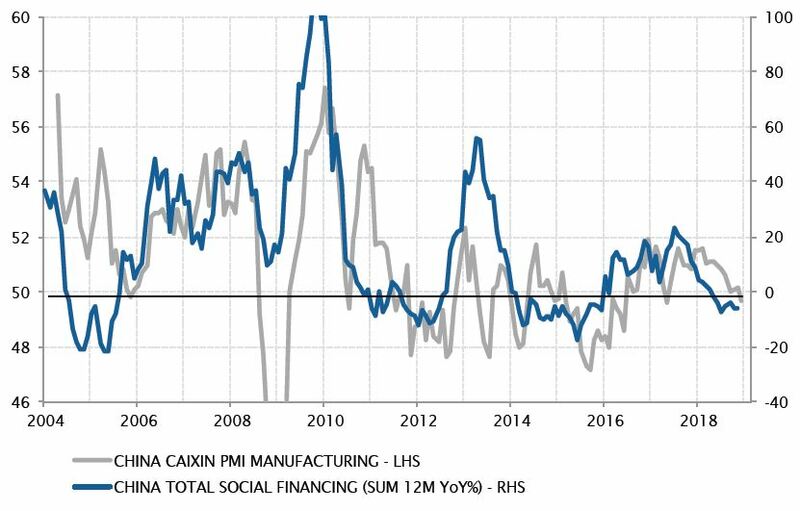 This slowdown was essentially caused by weaker dynamics in China and Europe, both experiencing a continuous loss of steam during the year. A combination of headwinds included domestic factors, such as tighter credit conditions in China, a negative inventory cycle in Europe and country-specific factors in Italy and France, and external factors, such as US tariff announcements and rising energy prices. These undermined economic activity, generating a negative feedback loop of business and consumer sentiment. On top of this, tightening US credit conditions, warranted by strong US growth, weighed on countries reliant on US dollar funding, especially in the emerging market (EM) world. As we enter 2019, the key question is whether these trends will end, leaving global GDP growth on a decent expansion path, or whether they will extend, morphing into a more pronounced and concerning growth soft patch. Monetary policy divergence was a key feature of 2018 and ultimately unsettled financial markets in the last quarter of the year. The extension of Federal Reserve rate hikes in the context of a global growth slowdown raised concerns about potentially unwarranted tightening, especially when taking into account the ongoing decrease in Fed balance sheet holdings. In the meantime, other central banks have not had the chance to follow the Fed, despite stating their willingness to normalise monetary policy. The European Central Bank managed to bring its asset purchasing programme to an end, but has been forced to become more evasive on the prospect of potential rate hikes. 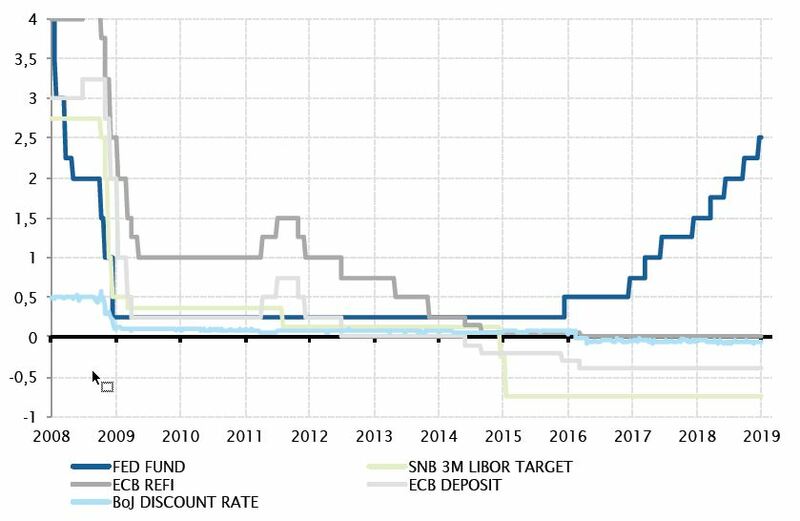 The Swiss National Bank, whose main constraint is the underlying strength of its currency, has no choice but to wait for the ECB to act before contemplating an exit from its uncomfortable negative rate policy. And the Bank of Japan can hardly move as it faces softer growth, zero inflation and a looming VAT rate hike in 2019, which will certainly weigh on final demand. The monetary policy divergence between the US and the rest of the developed world is becoming wide enough to trigger all sorts of negative side effects for financial markets. The last few weeks of 2018 have shown the Fed will find it hard to keep raising rates further if others do not. The Chinese economy was front and center in 2018. Its growth slowdown had a substantial impact on global activity, due to its contribution to world GDP and its indirect impact on commodity and industrial goods exporters around the globe. Perhaps counterintuitively, China’s weakness was not directly related to the headline news around trade and the imposition of US tariffs on a growing number of Chinese exports. In reality, the tariffs spurred export activity, as companies frontloaded orders ahead of their imposition. It is the domestic side of the economy that essentially undermined growth in 2018. The decision to rein in lending at the end of 2017 proved to be ‘too effective’ and mistimed. Domestic credit, measured by the Total Social Financing aggregate, declined last year, despite attempts to reverse the trend. Gauges of activity, such as the Purchasing Managers’ Index, also followed this downward trend. A reversal in the lending growth dynamic is to be expected in order to spur a pickup in domestic activity this year – especially if US tariffs are confirmed and begin to weigh on the external side of the economy. Emerging markets endured a challenging year. 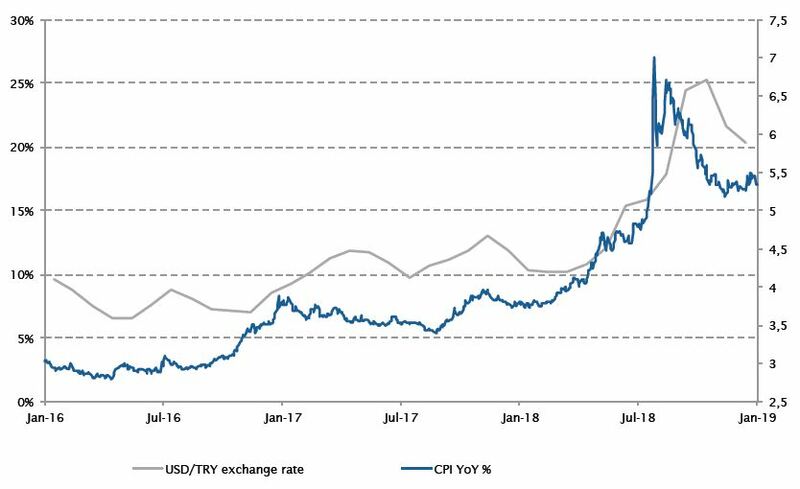 They particularly suffered from Fed monetary policy normalisation, coupled with mounting trade tensions, the Turkish crisis and oil price volatility. In the context of a stronger US dollar and higher US interest rates, many EM central banks were forced to raise interest rates to defend their currency and prevent inflationary pressures. 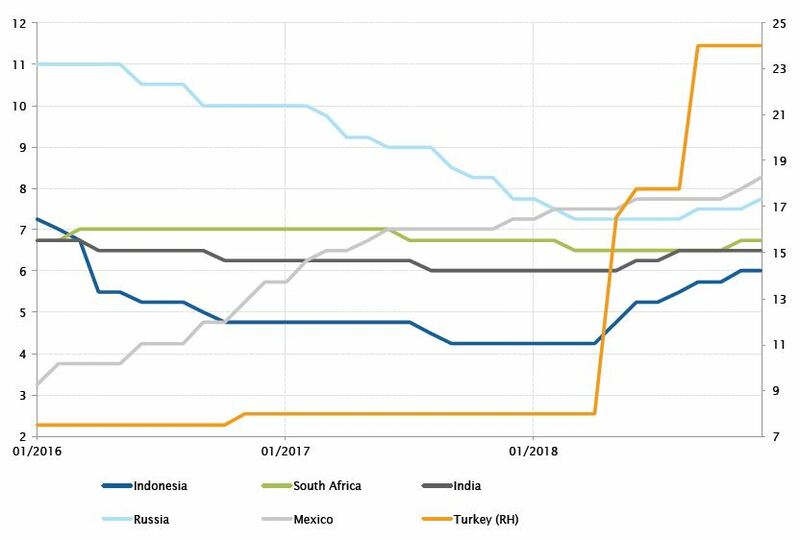 Among the major emerging economies, several countries – Indonesia, India, South Africa, Turkey and Russia – ended their easing cycles or hiked rates after a long pause, while Mexico continued to follow its normalisation path along with the Fed. Bank Indonesia was the most prompt to act, raising interest rates six times, by a total of 175 bps, to curb rupiah depreciation. It did so because Indonesia is particularly fragile to a global sell-off, due to a large current accounts deficit and reliance on foreign capital. While some major EM central banks remained on hold, like China, which kept an easing bias to support its slowing economy, or Brazil, whose inflation remained contained, emerging markets’ monetary policies generally shifted to a tighter stance in 2018. While the Turkish economy was quick off the starting blocks, beginning 2018 with a GDP expansion of 7.2% in the first quarter, the story turned sharply into a nightmare. During the summer, the country saw its currency lose close to 40% against the US dollar, with inflation rising above 25% – the highest rate in 15 years – and a sharp increase in loan defaults, caused by rising borrowing costs. A diplomatic crisis with the US, which came amid conflicts over security policy and the detention of an American pastor by Ankara, was a source of ongoing tensions. But it only accelerated a crisis that had already begun. The country was, and still is, in a challenging economic situation with massive corporate debt denominated in foreign currency and the independence of its monetary policy is highly questionable. The Turkish economy began contracting in the last quarter of 2018 and the recession may last for at least the first half of 2019. 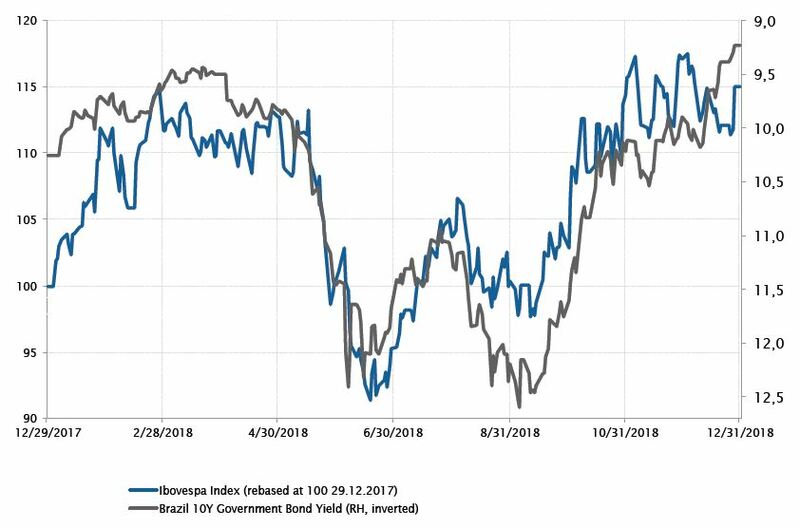 Brazilian assets were among the only ones to finish the year in positive territory: the Ibovespa closed the year up 15%, while the Brazil 10-year government bond yield rallied from its highest level at 12.6% in May to 9.2% at the end of December, and the Brazilian real increased more than 14% against the US dollar. The new President Jair Bolsonaro, elected in October, boosted Brazilian assets with his pro-business agenda. This change in the political landscape, with the far-right coming into power, pushed confidence and activity indices higher. The Brazilian economy enjoys a solid external position and a large amount of foreign exchange reserves. Nevertheless, the reality Jair Bolsonaro is facing is also one of unsustainable fiscal deficits waiting to be resolved. The pensions reform is another big issue which needs to be addressed to tackle the deficit; the government must obtain approval for it in Congress, where no clear majority stands. However, if the government cannot reduce these fiscal imbalances, there is no doubt the positive sentiment on Brazilian assets will reverse. US government long-term rates were generally higher in 2018. Short-term rates rose to their highest level since 2008, driven by the Fed’s monetary policy normalisation. Long-term rates also climbed. The Benchmark US treasury 10-year finally broke above 3% and hit 3.25% in October, before falling back to 2.68% by year-end – still above the 2.4% level prevailing at the beginning of 2018. But the key feature of US rate movements in 2018 was probably the fact they were mostly driven by a steady increase in real yield – excluding inflation. Up 55bps in 2018, the real US 10-year rate reached 1% for the first time since 2011. In the meantime, inflation expectations ended the year down 27bps, due to a late oil price drop, despite having until then remained remarkably anchored around 2%. In other words, the rise in US rates witnessed in 2018 was essentially driven by rising real yields, not by higher inflation expectations. The movement was certainly driven by the Fed’s push towards less accommodative credit conditions, a move that also led to a further flattening of the yield curve. 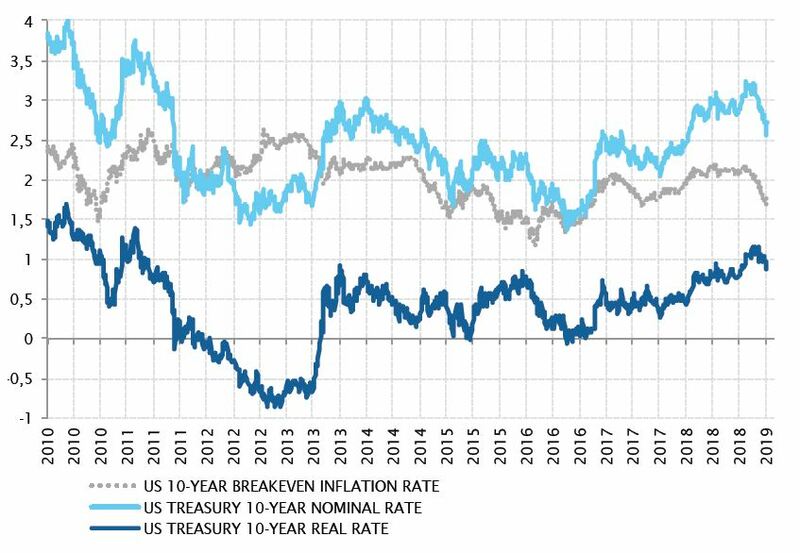 In 2019, US long-term rates are, on the contrary, likely to be mainly driven by inflation expectations, while the real rate component appears to have less upside potential. Following the 4 March general election, a period of political uncertainty around the formation of a government began and lasted until late May, when the populist Five Star Movement and League finally formed a coalition. During this period, peak uncertainty was reached when President Mattarella rejected a euro-skeptic finance minister, fuelling the risk of new elections. 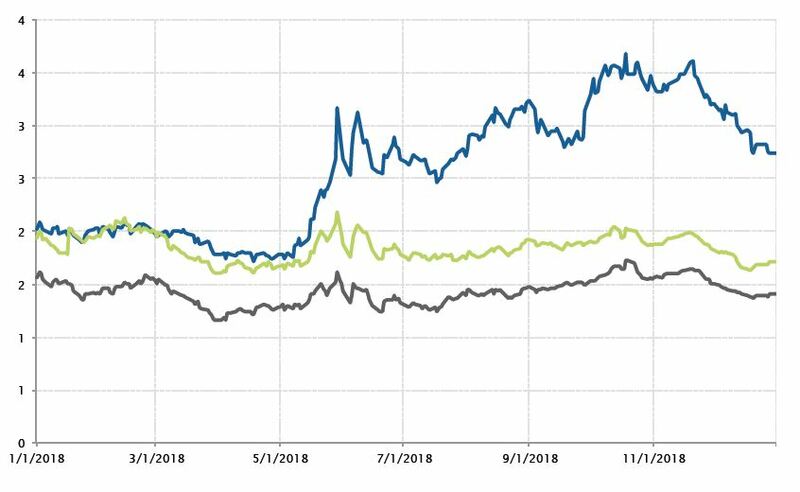 The Italian 10-year BTP yield surged to 3.16%, dragging down the whole European periphery, as investors feared the further rise of the anti-euro camp in the election campaign. After initially mentioning a fiscal deficit of 1.6%-1.7% for 2019, the government announced a deficit of 2.4% of GDP, which would break EU rules by expanding public debt. At the end of September, the European Commission rejected the Italian budget and threatened to put the country into Excessive Deficit Procedure (EDP), potentially leading to sanctions. Italian rates resumed their sell-off, reaching 3.68% in October, without affecting Spanish and Portuguese rates. After proposing a revised deficit of 2.04%, Rome finally reached a compromise with Brussels, fuelling the rally of the Italian 10-year yield, which edged down to 2.74% at year-end. Nonetheless, Italy’s economic structural problems remain, and the risk of an EDP is merely postponed. This is emphasised by the wide spread which remains between Italian and Portuguese or Spanish rates. After a prolonged era of quantitative easing that had the effect of compressing volatility, developed economies are entering into a phase of quantitative tightening, in which monetary stimulus will start to be removed. The effect of QE was hard to estimate when it started, but understanding the impact of exiting from this environment is even harder. 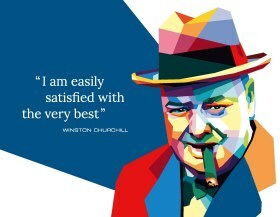 Nevertheless, one thing seems certain. 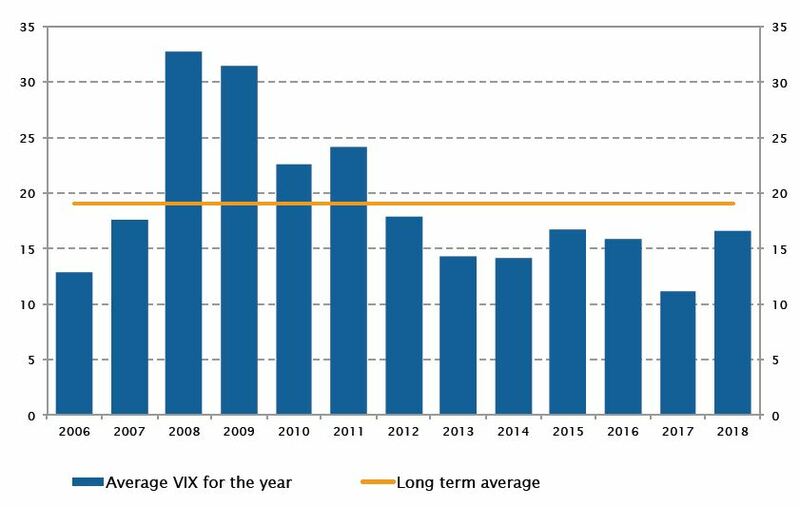 We are entering a new volatility regime. On top of this, general market liquidity is estimated to be lower, making the market less resilient to stress. Finally, the US 10-year yield has an enormous impact on the supply of structured products designed to enhance returns, such as systematic volatility selling. All in all, investors should prepare for higher volatility. Commodities – Is gold shining again? 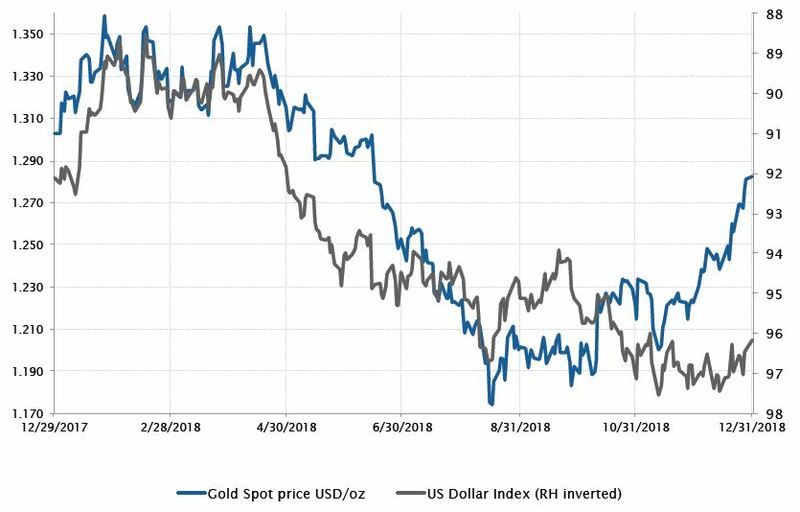 Aside from geopolitical risk and investor sentiment, the two main drivers of gold are the US dollar and US long-term real rates, which have historically had an inverse correlation to the precious metal. In 2018, gold lost a bit less than 14% from its peak in January to its trough in August, before bouncing back 9% and closing the year at about 1280 USD/oz. In parallel, the US dollar edged higher from early 2018 until August, before the pace of appreciation slowed. The Fed monetary policy became less hawkish than anticipated by markets and this was one of the main drivers of the weaker US dollar, while gold regained its safe haven asset status in the risk-off environment of Q4. Going forward, the evolution of gold prices is likely to remain torn between two forces – the greenback and US long-term real rates. If you believe US real rates will continue to rise meaningfully, you should stay away from gold, but if you believe in the continuation of a weaker US dollar and a muted increase in US real rates, gold could continue to shine.